The striking Micromussa Coral has become a very exciting discovery for reef aquarists! The beautiful Micromussa Coral Micromussa sp. has wonderful natural colors, and even more stunning colors in captive bred specimens. They come in colors ranging from red, purple, green, orange, blue, rust, brown and pale gray, to pale tan. The colors can be solid or in combinations with a contrasting center. Some specimens have a white or gray ring around the center, and some can even have speckling. Common names for the Micrommusa Corals are Micro Coral, Pineapple Coral, Moon Coral, Brain Coral, Closed Brain Coral, and Meat Brain Coral. Yet descriptive names of captive bred specimens are very creative, including such things as Japanese Micromussa, Aussie Micromussa, Independence Micromussa, Fire-Red, Toxic Candy, Neon, Smashmouth, Mirco Candy Striped, Trinity, Gent, Pink Lemonade, Pink Floyd, Super Red, Blazing Red, Red & Gold, Passionfruit Micromussa, and more. This highly favored genus is a more recent and somewhat rare addition to the reef hobby. The Micromussa genus itself was only just described in the later 1900's. Prior to that it was included in the Acanthastrea genus. As more and more specimens were identified and placed in the Acanthastrea genus, a reclassification placed those with smaller corallites (8mm or less) into a new genera called Micromussa. Due to its close relationship to other members of the Mussidae family, especially its close cousins in the Acanthastrea genus, identification is a bit tricky. 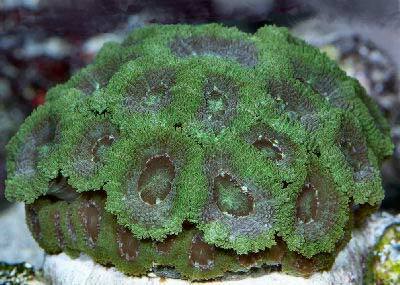 The Micro Coral has the appearance of being a cross between Favia and Acanthastrea species. It can easily be confused with the brightly colored Acan Lord A. lordhowensis or the Acan Enchinata A. echinata. Adding to the confusion, the polyps tend to look a little bit like the Pineapple Coral Blastomussa merletti. Like members of the Acanthastrea genus, the Micromussa Corals have most likely been a regular import, just misidentified and therefore simply called a brain coral. In order to ensure an accurate purchase, it helps to learn the skeletal as well as physical structure of the different members of the Mussidae family. Colonies of Micromussa species have 5-6 millimeter corallites (the cupped skeletal structure that the fleshy polyp grows over). Their corallites are cerioid, meaning they shares the same wall with each other. Putting the coral in very cold salt water can cause it to retract almost entirely for accurate measurement, and it will restore itself after a bit. The corallites of Micromussa species are always smaller than any of the Acanthastrea species when mature. The Micromussa Coral is a very attractive large polyp stony (LPS) coral and makes an excellent centerpiece for the aquarium. Like other other Mussids, they are easy to care for. Provide a medium light and gentle water movement. Too strong a light will prevent the polyps from opening fully. Feeding at least once a week is fine, but providing several feedings a week will make them grow faster. You also don't need to feed each individual poylp, as all polyps contribute to the well-being of the colony. Many people have propagated these easy to grow large polyp stony (LPS) corals. So although they are still considered more rare, availability is much better today. However some of the very colorful aquacultured specimens can be a bit pricey. This is a short video that gives a quick glimpse of the breathtaking colors that the Lordhowensis Coral can be found in! Their skeletal walls vary in height and the polyp or corallite centers are often a different color than the surrounding flesh. They are hungry corals, happy to eat mysis and similarly sized foods every other day! Squeezing some "juice" from the food over the colony will get them to open up and extend their tentacles, at which time you can directly feed them minced meat! They do not do well in strong lighting and need low to moderate light and moderate water flow. Distribution / Background Micromussa Coral Information: Micromussa is a small genus in the Mussidae family There are 3 Micromussa species that are officially recorded at this time and they are M. amakusensis, M. diminuta, and M. minuta. M. amakusensis was described by Veron in 1990. M. diminuta was described by Vernon in 2002. M. minuta was described by Moll and Borel Best in 1984. Common names the Micromussa genus are known by are Micrommusa Corals, Micro Coral, Pineapple Coral, Moon Coral, Brain Coral, Closed Brain Coral, and Meat Brain Coral. They have also been inaccurately labeled as Micromusa, Acanthastrea, Favia, Blastomussa, Merleti, or have been called Acanthastrea lordhowensis. The Micromussa sp. has been propagated in captivity with great success. Descriptive names of captive bred specimens are very creative, including such things as Japanese Micromussa, Aussie Micromussa, Independence Micromussa, Fire-Red, Toxic Candy, Neon, Smashmouth, Mirco Candy Striped, Trinity, Gent, Pink Lemonade, Pink Floyd, Super Red, Blazing Red, Red & Gold, Passionfruit Micromussa, and more. Where Micromussa Corals Are Found: The Micromussa sp. are found in the Indo-West Pacific. M. amakusensis is found in the western Pacific and south to Australia. M. diminuta is found in the areas from Sri Lanka to the Philippines. M. minuta is found in the areas from the Philippines to Java, Sri Lanka and then to Papua New Guinea. Micromussa Coral Habitat: The Micromussa sp. inhabit water ranges from 0 - 98 feet (0 - 30 m) in depth, and like other Mussidae, they inhabit a wide range of reef habitats. They feed at night, extending tentacles. Status The Micromussa sp. is not on the IUCN Red List of Endangered Species. Description What do Micromussa Corals look like: The Micromussa sp. has 5 - 6 mm corallites. Corallites are the cupped skeletal structure that the fleshy polyp grows over. The corallites are cerioid, meaning they share the same wall with each other, and these walls are thick. The septa (the thin bony part if the corallite) is beaded rather than thin and sharp, or being "tooth like", as in the case of some Acanthastrea species. The colorful tissue is not as fleshy and thick as some of the other Mussids. They come in colors ranging from red, purple, green, orange, blue, rust, brown and pale gray, to pale tan. The colors can be solid or in combinations with a contrasting center. Some specimens have a white or gray ring around the center, and some can even speckles. Life span is unknown. The Acanthastrea corals have much larger corallites. The biggest identifier is that a Micromussa will never have a corallite that is 8 mm or more across (usually less than the thickness of a typical pencil). This is unlike Acanthastrea that has a span of 8 mm - 15 mm across. Mind you this is the corallite, the skeleton, not the polyp. Unlike the Blastomussa, the corallite walls of Micromussa species are not "separate" on its skeletal structure. Rather all its corallite walls are shared between the individual polyps. The expanded polyps give the illusion of separate polyps with individual corallite walls, but don't let that fool you. Difficulty of Care Micromussa Coral Care: Like other Mussids, the Micromussa sp. is easy to care for. Strong light will prevent the polyps from opening fully. Moderate light is needed and water flow should be low. Like other members of the Mussidae family, the polyps tentacles come out at night to feed. Foods / Feeding Micromussa Coral Feeding: The Micromussa genus, like other large polyp stony (LPS) corals, have developed several feeding strategies. Through a symbiotic relationship with a marine algae, known as zooxanthellae, they receive some of their nutrients. They also capture planktonic organisms, food particles from the water column, and can absorb dissolved organic matter. In captivity,Micromussa sp., like Ricordea (a type of Mushroom Coral), they can be fed zooplankton, mysis, cyclopeeze, and other very small prey in the evening. Feeding once a week is fine, but feeding several times a week will help them grow much faster. The Micromussa corals will not do as well in a "pristine" water environment with no fish, as fish provide a source of nitrogen that they need to thrive. Calcium nitrate is also appreciated. Note that this is different from just plain calcium that we all add to our tanks for our corals. Aquarium Parameters A well-feed live rock/reef environment is what is needed for your Micromussa Coral, along with some fish for organic matter production, and dissolved organics. A mature tank is recommended. Be sure to have proper water movement and lighting. Provide moderate lighting and a low to moderate water flow for the best health. The Micromussa Coral will not fully open under lighting that is too strong. This is an aggressive species, extending their sweeper tentacles at night. There needs to be plenty of space between it and other corals. Compatibility and Social Behaviors The Micromussa genus is aggressive towards other corals. The Micromussa sp. will get along with their same species, but typically different colors of different species tend to be more aggressive. They do need to be kept well away from other corals. They have tentacles that come out at night and sting nearby corals. They do not do as well in the presence of soft corals, so that type of mix should be kept to a minimum. The Micromussa genus are hermaphrodites that use external fertilization in the wild, but this has so far not been duplicated in man made systems. This genus reproduce asexually as well. In captivity, the Micromussa species will drop tissue when stressed, in an attempt to propagate. They can also be propagated by fragmenting. Propagation is very easy. Taking care to have clean or gloved hands, each polyp can be cut down the center of the polyp, through the mouth and can be cut in to halves or quarters. You can use a sharp scalpel, razor blade or dremel. Place the newly fragged polyp on the sand back in the main display. Putting them in a separate, "sterile" tank is not a good idea, since they need dissolved organics to survive. Make sure they have low water flow to help them heal. Potential Problems The Micromussa sp. are attractive and durable when their needs are provided for. Though they are pretty hardy, they can starve to death in a nitrate free tank, especially without regular feedings. Availability Micromussa Corals for Sale: The Micromussa sp. are very easy to find at pet shops and on line. The cost for online stores is around $30.00 to $80.00 USD per frag, up to hundreds of dollars for a small colony depending on size and/or color.